Piping stress analysis course delivers Piping stress static & dynamics analysis, Principal stresses and failure theories, Thermal stresses in piping systems. +–What is the objective of piping stress analysis course? Piping stress analysis course addresses pipe stress static & dynamics analysis. This 30 days course included pipe stress static analysis and pipe stress dynamics analysis. 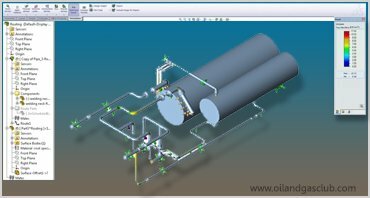 This course is based on hands-on solution of example problems in order to illustrate pipe stress analysis using stress analysis software. Piping stress analysis training is designed for almost anyone involved with piping in the petroleum, chemical, power, gas transmission, and related industries. Through our technical support we learn, every day, what engineers need to know, and we’ve tailored our course to give as much practical knowledge as we can in 45 days. The course covers proper system modeling guidelines, methods of static and dynamic analysis of piping systems, evaluation of system designs, and effective approaches to system redesign which helps piping/vessel, maintenance engineers, piping designers, new & experienced CAESAR II users, mechanical/design engineers, engineering managers, plant managers, and fresh graduate mechanical engineers who wants to become a piping engineer and who would like to pursue their career in plant design industry specifically as a pipe stress analyst. +–Who should attend piping stress analysis course? +–What is the duration of this course? ▸▾Who are the trainers of this course ? Our trainer has over 14 years of experience in fertilizer, power, pharmaceutical and oil and gas. He has through knowledge of piping & hanger support code & standards (e.g) ASME B 31.1, MSS SP s, ASTM, IS etc. Knowledge of seismic acceleration calculation, bid evaluation for spring hangers / rigid hangers, review of vendor drawings, etc. Previously he has done B.E (Mechanical). He is also lead consultant. ▸▾What is piping stress analysis & why is piping stress analysis needed ? Thus the process of determining, associating&analyzing the factors discussed is called stress analysis and this can be achieved by general layout design, rule of thumb, homographs, charts&various related software. For different industries&service requirements like power industry&power piping, process industry&process piping, pipelines, there exists simplified practical methodology of implementing knowledge which assists in achieving acceptable reliability; in the form of governing codes like ASME, AS-ME, SAME, ACME, ASSUME, ASHE, ASME, B31.3, B31.1, B31.4, etc. Thus with the proper blend of knowledge, codes and tools the requirements to meet the very objectives of piping design is must. ▸▾How engineering students benefit from this course ? Students who wish to pursue higher educational having strong oil and gas industry can also benefit from piping engineering course potential to get part time jobs in these industries while they study abroad and helps to achieve financial assistance and finally get into jobs on a full time profile with in oil and gas industries. Students can do piping engineering training and virtual project parallel to their university studies virtual project can be tailor-made to university project on request upon completion they can have a cv attractive to oil and gas industries. ▸▾Pay-scale of Piping Stress Analyzer ? Delhi, India’s capital territory, is a massive metropolitan area in the country’s north. The city have huge number of engineering colleges and they give nearly 90 to 95% of results, every diploma and non-IT engineers are qualified as become as piping stress analysis engineer. Most popular core companies like petrofac, larsen & toubro are have their operating centers in delhi. There is a bunch of opportunities for piping stress analysis designer to both fresher & experienced professionals. Enroll now & build-up your career with us.